Books, Candles, Scents, Spells, Cleansings, Energy stones, Healings, Crystals, Aura readings, Readings, Tea readings, Zodiac charts, Astrology, Numerology, Soul mate finder- match maker.Spiritual house blessings and cleansings and more. this spell helps reunite lovers, brings back your true love into your life. Helps heal broken relationship and restore love and passion. the future Protects aganist all. House blessings are also available to your work place for better results and job promotions.Helps with financially improvements and protect against all. with customize spells you can make one more specific to your case. will be removed from you completely. We call this one the Jealous spell. Be creative and let your guest be amazed. Available for halloween parties,functions etc. 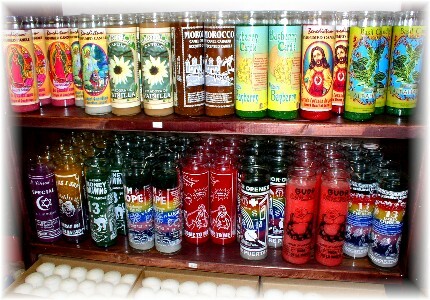 Magical and spiritual candles are assigned the appropriate powers to address a particular aspect of life's many issues and prolems. Incense has an elegant fragrance to create a mood of tranquility, peace of mind and relaxation of the mind, body & soul. Our skills are able to help you understand your astrological readings in such dept and detail your present will unfold in ways you never taught possible, allowing you to take command of your future. Determining the position of the planets at the exact moment of your birth allows you to understand and find out how they affect you in the present and will affect in the future. Having this information gives you the ability to affect your destiny and make active, positive choices for your life. Your palm contains the map of your life. It reflects your character as it is directly influenced by your psyche, the planets and past lives. Tarot card readings are an excellent way to explore and solve some of the questions of life. The tarot cards ae universal symbols that represent the experiences and challenges that everyone faces. Using the tarot allows you to solve problems, understand what fate is trying to communicate to you. The cards can help you understand your past and present and reveal your future course.